Click on the images above to see scans in our Flickr albums. Like they did for The Hunger Games last year, Us Weekly and People are releasing special edition issues of their magazine dedicated to Catching Fire! These magazines are typically jam-packed with awesome new pictures, interviews and details. Us Weekly are advertising 5 giant posters, 130 hot photos, new interviews, cast diaries and stories from the set. They are also hosting a sweepstakes to win a trip to the Catching Fire set location in Oahu, Hawaii! Click here for more details on how to enter. (link currently inactive). 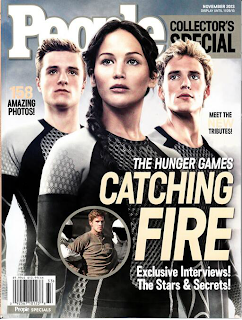 "From the Editors of Us Weekly comes the highly anticipated Hunger Games: Catching Fire Special Edition. This Collector's Edition features 130 hot photos, stories from the set, plus, new interviews and 5 HUGE posters." Pre-order this one from Barnes & Noble. People are promising 158 amazing photos, exclusive interviews with the stars and their secrets. Both magazines appear to be retailing at $10 each. "It's very rare when you genuinely feel you've made friends on a film. I was worried about entering this tight knit family, but they were all so welcoming." Many thanks to lawrence-daily, there-is-no-more-district-12 and strawberrycupcakeprincess for sharing the images!